At Modern Ob/Gyn, Drs. John and Ingrid Reyes are excited to offer the most advanced surgical techniques available in gynecologic surgery. Using the daVinci robotic system, Drs. John and Ingrid Reyes are able to provide their patients with groundbreaking alternatives to both traditional open surgery and conventional laparoscopy. Robotic surgery with the daVinci system combines the benefits of laparoscopic surgery with the dexterity of traditional open surgery. This allows a surgeon to perform complex procedures laparoscopically, that would previously have required a large open incision to perform. After the patient is asleep and positioned, laparoscopic ports (small 8mm access holes with sleeves) are placed into the patient's abdomen as in traditional laparoscopy. The daVinci surgical cart is then attached to the ports and specialized laparoscopic instruments are inserted. Unlike traditional laparoscopic instruments which have limited freedom of movement, these instruments are designed like a human wrist, with the ability to bend, rotate, flex, etc. The surgeon controls the movements of these instruments from a console located next to the patient. By manipulating hand grips within the console, the computer translates these movements into movements by the laparoscopic instruments. At no time does the computer "robot" perform any motion on its own - all actions are directly controlled by the surgeon. As an similar example, with some of today's advanced cars, when you press on the gas or brake, you aren't directly controlling a brake lever or throttle, you are telling the car's computer how much you want to press the brake or open the throttle. Click here to read a recent editorial about Drs. 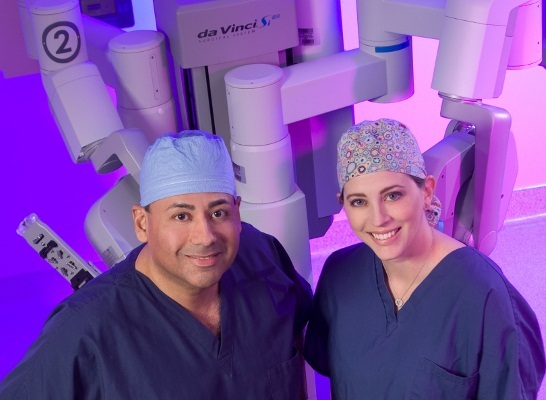 John and Ingrid Reyes bringing robotic gyn surgery to the Johns Creek area.